When it arrived we eagerly boarded our Blue Missile and departed for our halfway point between Vellore and Kanyakumari, Madurai. Like all our bus trips, this one was made better by everyones “Fun Fact of the Day”. Do you know why a nuclear reactor glows? We stopped only for our typical South Indian roadside breakfast/lunch, I had grew quite fond of the rapid serving style in these places and definitely another thing I’m going to miss. 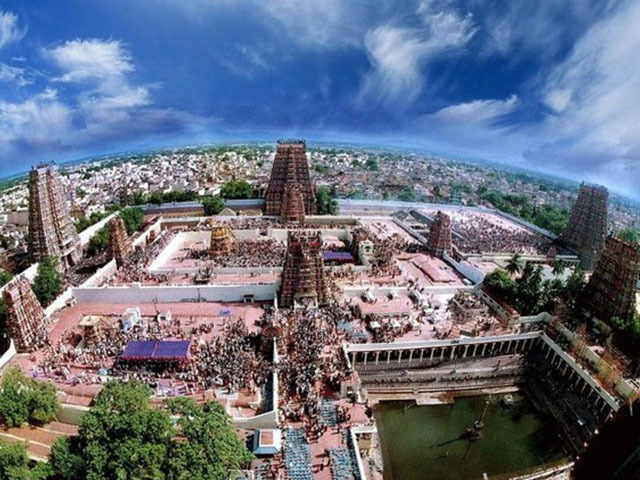 The ancient city of Madurai is home to Athisayam, a popular water park in Tamil Nadu, unfortunately we didn’t get time to visit. Fortunately though, we did get time to visit Meenakshi Ameen. 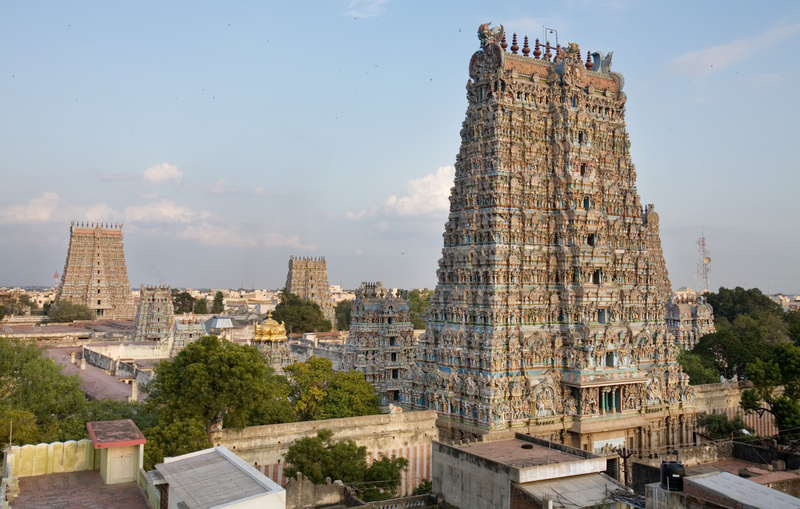 An enormous temple located in the heart of Madurai, it’s hard to convey just how gigantic this place is. The history behind it is also fascinating, frankly I could talk about it all day, but things to do, people to see. The largest of the gates is over 50m tall and has more than 1500 individual statues on it! Needless to say, I thoroughly enjoyed seeing the inside of the temple, the attention to detail for something of that size is just unbelievable. In my excitement, I forgot to mention our accommodation for that day. Beforehand, we had been told it was a hotel, in our minds that conjures up an image of a clean rooms, marble floors and a pretty exterior. Once again, that wasn’t the story in India, we were admittedly dismayed when we saw the building we were to stay in. It certainly wasn’t a Hilton. In saying that, the place wasn’t as bad as we had first thought, there were no holes in the walls and the AC worked, so like I said, not a total disaster. 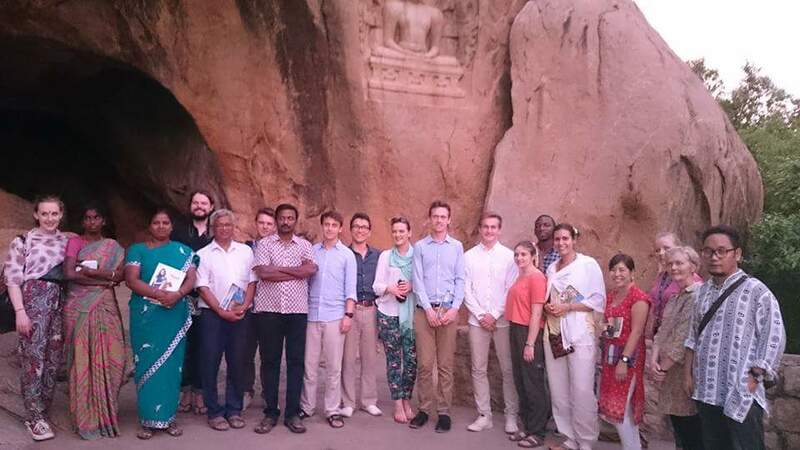 After our visit to the temple we went for dinner in another local restaurant and then travelled to the outskirts of the city where we were met by members of Green Walk, an organization dedicated to preserving India’s cultural history, we proceded to visit the nearby Jain cave where we were told by Green Walks founder how the historical site on the other side of the hill was destroyed in order to obtain marble, and also how this one was only protected as a result of it being a UNESCO Heritage Site. He brought to light problems we never even knew existed. After our visit to the cave, we went to the home of Green Walks founder, where we had the pleasure of meeting his family for some chai and biscuits. Like every other cool person in the world, his father was actually a physicist, and an inventor to boot! It had been a great day, but it had been a long one so there were no complaints when we were told it was time to return home. We thanked our gracious hosts and hopped in the Blue Missile to return to our “hotel”.